Whether you are interested in buying or selling, rest assured that you will leave with a smile on your face!We have been in the used furniture business for a total of 20 years. Over the years, one thing led to another and we started to become somewhat pack rats! Eventually, we decided to turn our hobby into a fun, family business. After moving from California, we decided to open our first store called Kohala 2nd Hand on the Big Island of Hawaii and ran it for seven years. We loved our new life and business, and even became friends with many of the frequent customers. Things were going very well for us in Hawaii, but the mainland seemed to be calling our names again. We decided to move to Oregon with intentions of opening a new store. Within a few months of arriving here, River Road 2nd Hand opened its doors on October 1st, 1997 for the first time! The store started out somewhat small, but within a very short time we began having many customers that continued returning due to our great customer service and goods for sale. River Road 2nd Hand quickly became more popular with the locals of Lane County. People were watching our commercials on TV and coming to visit the store from as far away as the Oregon Coast!! With the success and popularity from this store, we decided to expand and grow along with the town of Eugene. 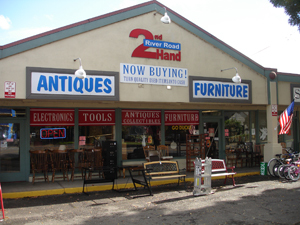 River Road 2nd Hand now has two open showrooms, which means more room for customers and more goods to sell!